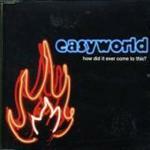 After a wait of over 6 months, Easyworld return to the singles market with a single not featured on any album. Apparently the record company didn't think there were any suitable singles on the album, so they were told to write a "hit". The leading track sees the a return to the Easyworld 3 minute pop song, which is slightly reminiscent of the song Better Ways to Self Destruct, with a harmonica solo not unlike the harmonica part to the alternative recording of 2nd Amendment, and ending with Dav bringing out his mandolin for another outing. The beautiful cover of Candi Staton's Young Hearts Run Free is Dav playing solo piano and singing, and is worth the £3 for this song alone. You Can't Tear Polaroids is a Jo penned song, with a catchy chorus, and equally catchy guitar hook. Overall, a fantastic single that deserved much better than its number 50 chart placing.